Every year I try and build a new prototype to test new geometry out on the trail and try out new set up tweaks. This past season, I built a new mountain bike that totally had my mountain bike world turned on its head. I immediately went back to the drawing board and slugged it out in the heat of July, being forced to weld late into the night due to the high heat. But the result was what I’ve come to call “44WRD” geometry. 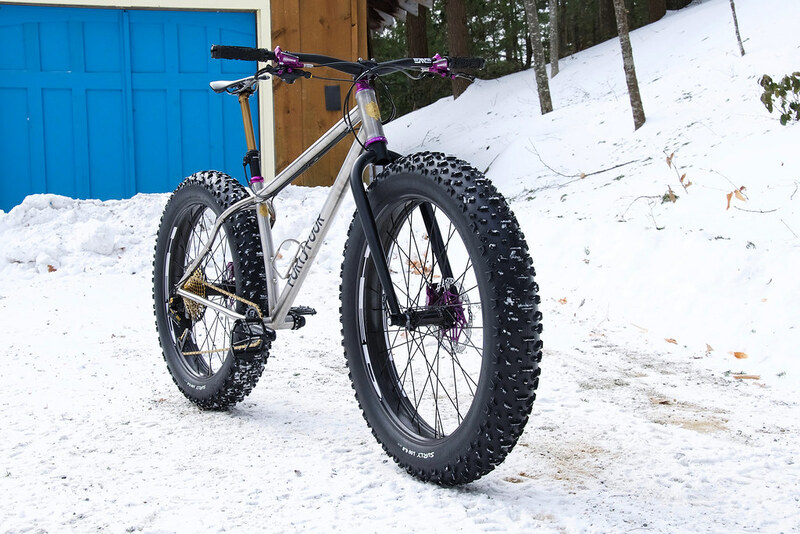 From that new pair of bikes (I built one in steel and another in Titanium for a total of 4 prototypes this past summer) it got me to thinking a bit about how some of what I learned with that new geometry could be applied to my fat bike. 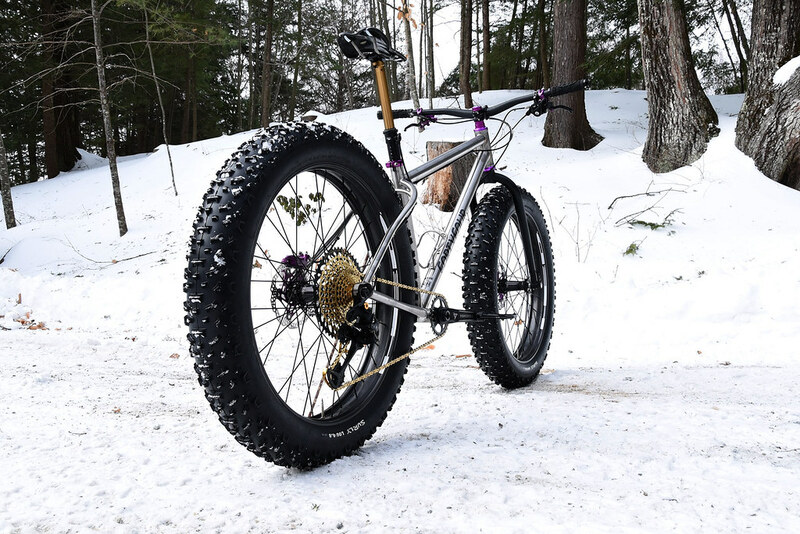 As the weather turned cold, and eventually it snowed early in November or December, within the first ride out on my current fat bike I knew I had to make changes. It wasn’t long enough. It wasn’t low enough and it certainly wasn’t slack enough! And darn if I didn’t need a dropper on that beast. So back to the drawing board I went. The result is up above. Considerably longer, lower, slacker. Let’s roll up those sleeves and take a closer look to see what makes this one tick! Geometry: I kept with my tried and true bottom bracket drop (3.00″) but what I learned out on the trail this past summer was increased trail increased stability and the bikes ability to correct and seek balance. So the head tube angle was slackened out to 67°. Combine that with a custom unicrown fork and custom rake produces about 105mm of trail. One big problem I have found is on about 90% of my rides, I’m breaking trail and you can lose forward momentum quickly when you have to climb up these short steep sections we typically have here in NH. And on a fat bike while breaking trail, often through a crust, you can stop dead in your tracks and start tipping backward. 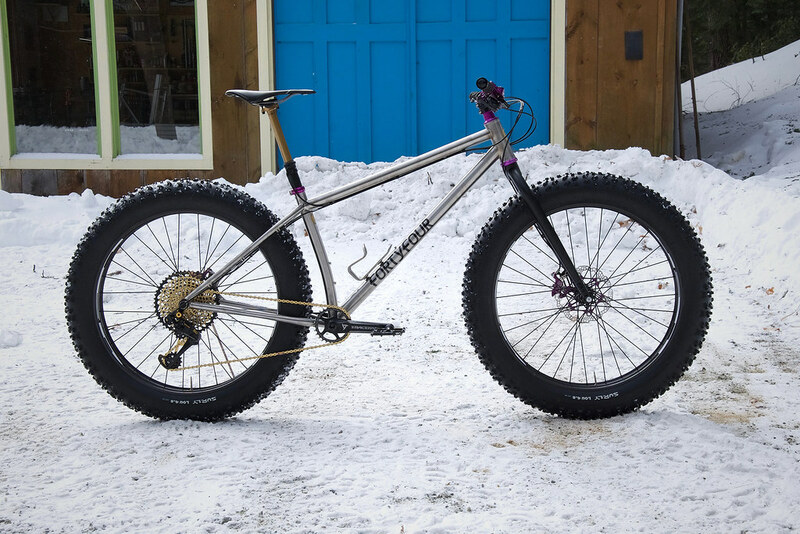 One of the points I want to explore is lengthening the chainstay quite a bit. So with this build, I grew that sucker from 17.25″ (previous build) to a full 18″. I know that’s long but I wanted to get that rear wheel behind me on short steep climbs. So if you look at the bike in profile, it’s really been stretched quite a bit in both directions. 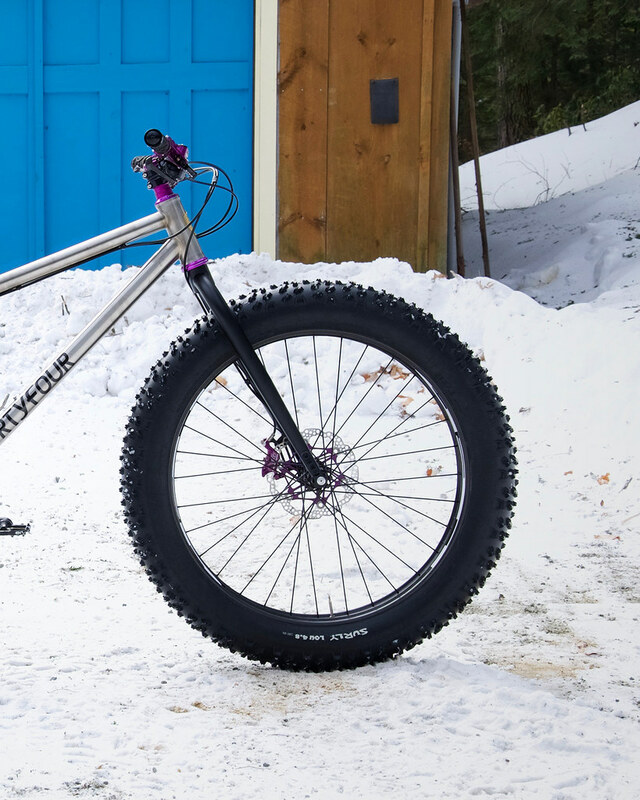 That long wheelbase will also help with additional float and I’ve built in a bit more room to fit larger tires and studded tires are on the list for this build (more on that in a bit). The front is 15x142m m TA as that is just what my wheelset was built as and the rear is 197mm TA. The previous build was still a quick release set up, so it will be nice to have that added layer of power transfer thanks to the TA’s and added point of triangulation. Setup: One of the things I wanted to upgrade was to move to hydraulic brakes. Hope R4’s takes care of that! Another set up must was adding a dropper. 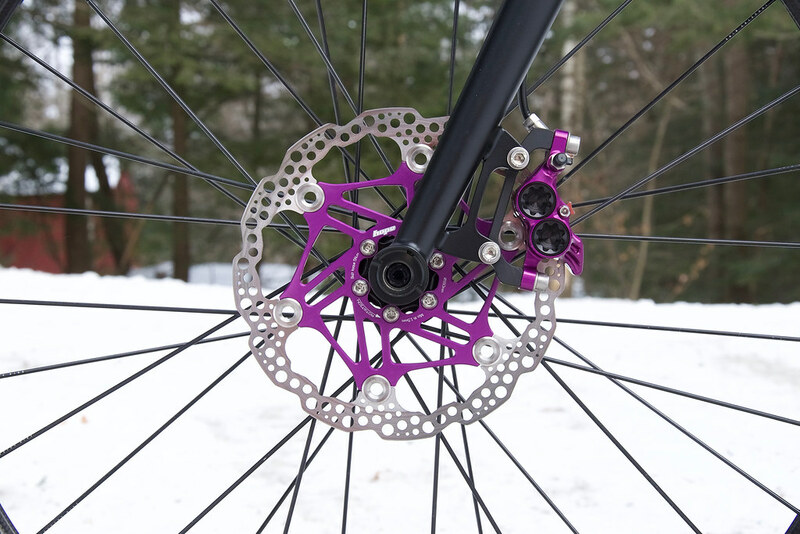 I’ve come to really enjoy the benefits of a dropper on my mountain bikes and I can see the benefits of this on a fat bike where lowering your center of gravity is crucial for maintaining traction in certain conditions. A Fox Factory Transfer was my go to pick due to it’s simple and clean exterior routing. I also bumped my drivetrain up to Sram’s Eagle 12 speed. That 50t may come in handy! One last tidbit was to move to a set of studded tires. Currently mounted in the pics are a pair of Surly Lou’s but Terrene Johnny 5 Light studded will sport the front and a Wazia 4.6 Light studded will sport the rear. Really curious how these tires perform. The Johnny 5 is mounted and stretching out as I type to 4.67″ last I measured on my HED rims which are 80mm. We’ll see where they end up. But I’m curious just how much control the studs add to our conditions which seem to change each day as of late. Ice abounds. The Ride: I was able to take the bike out once it was all finished up this past Saturday as the snow was tapering off Sunday evening. I was able to get out on plowed roadbeds as it was a bit too deep and ungroomed in the woods just yet. But my hour ride out on the plowed dirt roads to the trailhead and back were largely more predictable especially if the front wheel encountered a soft spot of snow. The snow this storm seemed to be a very fine, powdery ice-like snow. Not sticky but quite slippery. Being able to correct easily came in handy. Also headed downhill dropping the saddle and lowering my center of gravity was far less disconcerting at times when I knew I was on ice or soft snow. So confidence was improved. I’ll be putting this bike through it’s paces this season and I’ll be sure to report back in once I’ve got more to say. 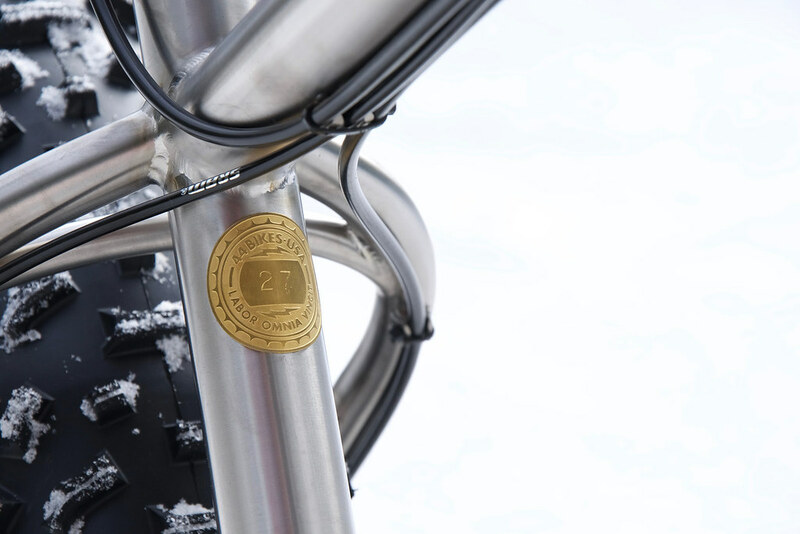 And of course, this bike is Titanium! So that’s a big change. Till next time, here are a few details. Enjoy. Paul Components Box Car Stem – 35mm length. 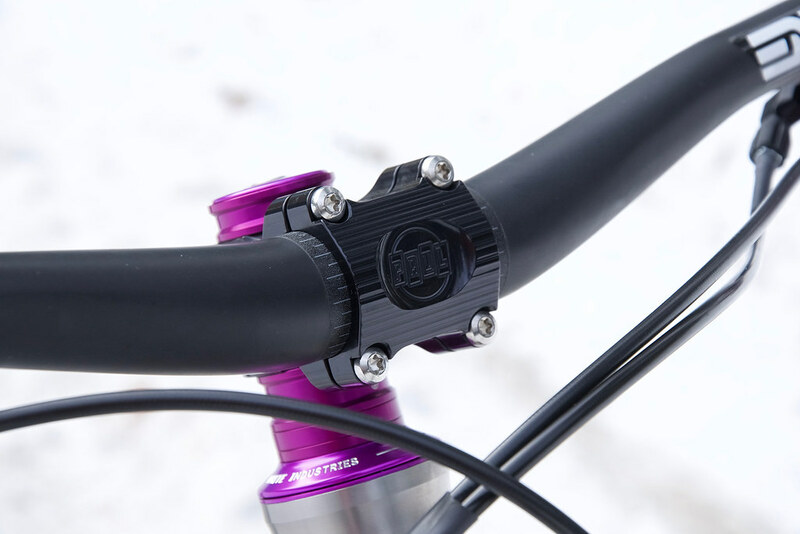 I have to say, I now have this stem on both my mountain bikes and my fat bike… It’s one of the few short and really well designed/machined stems on the market. Highly recommend Paul! Lucky Number 27! That’s my grandfathers ol’football number from East Greenville High School. The Yellow Jackets! Always gotta have his number on one of my bikes. What’s your lucky number going to be? Hope Tech 3 E4’s! 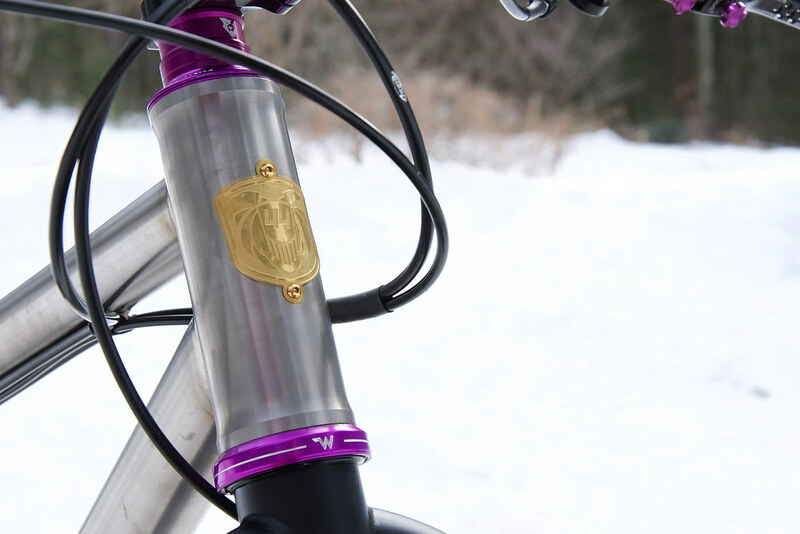 Purple parts came off my singlespeed for the Philly Bike Expo but I already knew that the fat bike was going to have a purple and gold theme… These suckers are pretty sweet. White Industries 44mm Headset. One of the nice details about these headsets is the crown race is split so it simply slides on. Also, it’s exactly the same as a Cane Creek 110 headset. Easy swaps! And this shot because SLACK.